A group of five 8th grade student leaders under the guidance of Middle School Science Teacher Chelsea Fajen worked together to lead a service and gratitude project in early November. 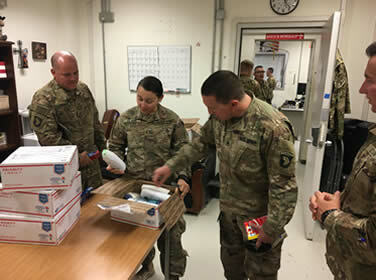 Their aim was to collect a variety of needed items to send to the Task Force Panther Battalion, currently stationed in Afghanistan. Students in each advisory were asked to donate requested items, including toiletries, Amazon and iTunes gift cards, snacks, and blank stationery. They then wrote letters to express their gratitude to the soldiers, taking time to write meaningful personalized letters thanking them for their service. The Task Force Panthers are a team of soldiers from Alaska, Hawaii, DC, Maine, and North Carolina's Army National Guard. An aviation unit, they support the mission in Afghanistan by providing assistance and expertise in helicopter travel and maintenance throughout the country. Ms. Fajen's brother is a member of the TF Panthers. Items collected by the student advisories included toothpaste, liquid soap, shampoo, and snack foods like chips, pretzels, popcorn, along with gift cards and stationery. The students put together over 30 care packages from the items and organized two bake sales to cover the cost of shipping the boxes. The service men and women of the TF Panthers will receive the packages just in time for the holidays. "We collected so many items thanks to the enthusiasm and generosity of our Middle School students and families," said Mrs. Fajen. "It was a huge success!" 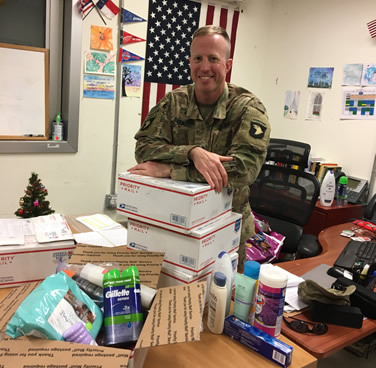 Update: The Task Force Panthers received their packages, including the items and the notes from students, the day after Thanksgiving. The entire battalion expresses their thanks to Bullis and especially to the student group that organized the drive. The soldiers were so pleased. "Look what arrived today!" wrote Ms. Fajen's brother. "The boxes came at a perfect time. We're sending a crew out on a longer mission and they won't have showers. When we're in the field we use baby wipes to stay clean. We have already packed all of the baby wipes for the mission! Everyone was shocked that all of the products were name brand. We're used to getting non name brand items! The cards were heartwarming and this shipment means so much to us."